Gas Detectors are an integrated part of the safety protocol in the petroleum industry where gas leaks may have devastating impacts. The primary line of defense against gas leaks is the portable gas leak detectors which is mandatory for every personnel. 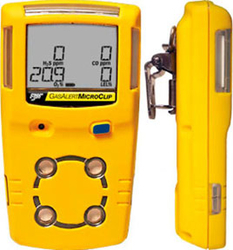 These portable and easy to use gas detectors provides upto 3 years of maintenance free operation with no need for sensor replacement or charging. The gas detectors come with a IP66/67 rated conforming to European standards. Adex International is an authorized distributor of BW Technologies with operation in Dubai, Sharjah, Ajman, Ras Al Khaimah, Abu Dhabi and Alain. ADEX INTERNATIONAL LLC primarily focus on export of BW Technologies gas detector to GCC countries like Saudi Arabia, Oman, Kuwait, Bahrain, Qatar and also African countries like Egypt, Lebanon, Sudan and Russian countries like Azerbaijan, Uzbekistan etc. BW technologies is the premier brand for gas detectors and is used extensively all around the world in sensitive locations like oil rigs, oil terminal, army bases, treatment plants, chemical manufacturing facilities etc. BW is the preferred brand in gas detectors in the GCC with a market share of about 85%.